(15/122) TRENTON – New Jersey’s municipal governments will receive more than $14.3 million in state recycling grants to help implement and enhance local recycling efforts, the Christie Administration announced today. The funds, based on 2013 recycling performance, are being awarded through the state’s Recycling Enhancement Act. The recycling grant program is funded by a $3 per ton surcharge on trash disposed of at solid waste facilities across the state. Distribution of grants this year is based on the recycling successes local governments demonstrated in 2013. The grant program is designed to reward local governments for good performance and to enhance recycling efforts across the state. Each award is based on materials collected and recycled and can be used in various ways to improved recycling results, such as producing educational materials and paying salaries for recycling coordinators. In 2013, New Jersey generated more than 10 million tons of municipal solid waste (MSW). The DEP documented the recycling of more than 4.3 million tons of recyclable municipal wastes, which includes items such as glass, aluminum and other metals, and paper. This resulted in a MSW recycling rate of 43 percent. In comparison, the national MSW recycling rate in 2013 was 34.3 percent, according to the federal Environmental Protection Agency. Overall, New Jersey in 2013 generated more than 21 million tons of solid waste, which includes municipal waste plus construction debris and other types of non-municipal waste. 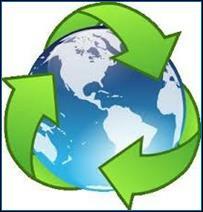 Of this, more than 12 million tons were recycled, for an overall recycling rate of 58 percent. Municipal programs receiving the highest grant awards for 2013 recycling efforts are: Newark (Essex County) $414,754; Jersey City (Hudson County) $290,150; Brick (Ocean County) $280,093; Vineland (Cumberland County) $255,217; Secaucus (Hudson County) $228,216; Paterson (Passaic County) $219,495; South Brunswick (Middlesex County) $179,776; Toms River (Ocean County) $174,524; North Bergen (Hudson County) $172,451; Woodbridge (Middlesex County) $167,846; Clifton (Passaic County) $166,856; Hamilton (Mercer County) $144,115; Cherry Hill (Camden County) $139.961; Middletown (Monmouth County) $118,916; Bridgewater (Somerset County) $114,698; Old Bridge (Middlesex County) $114,045; Carteret (Middlesex County) $108,392; Logan (Gloucester County) $106,705; Fair Lawn (Bergen County) $103,437; East Brunswick (Middlesex County) $102,397; Paramus (Bergen County) $101,810; and Freehold (Monmouth County) $100,741.